Freddie Sherrill at his graduation from Queens University of Charlotte. Freddie Sherrill was homeless, an alcoholic and drug addict, and he used to steal his kids’ Christmas presents from under the tree and sell them. He was eating out of dumpsters. He could not read or write. Sherrill spent years in and out of prison and rehab centers in North Carolina. He once threw a brick through a store’s glass window on a freezing night so police would bring him in from the cold. But after a long and painful journey, Sherrill was able to claw his way back to sobriety and he even learned to read. 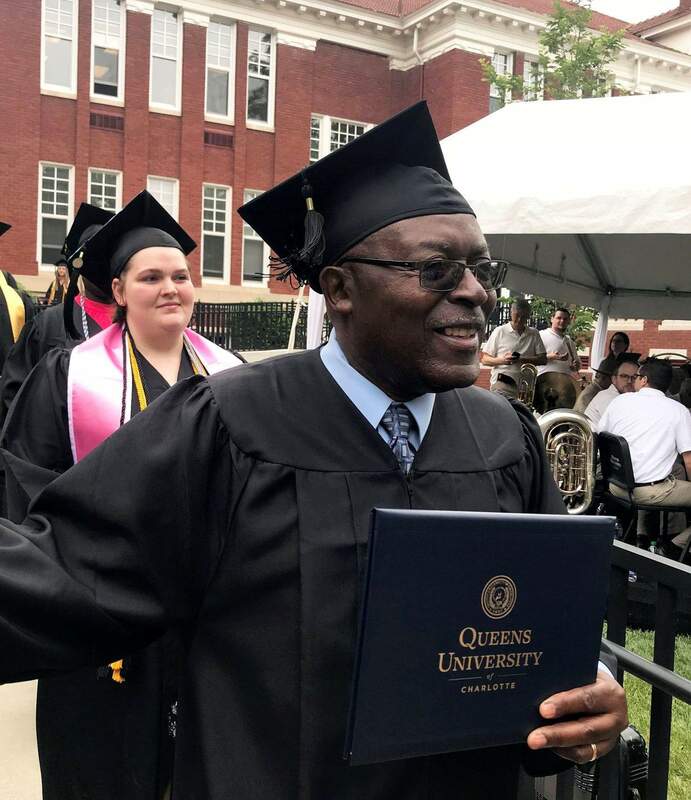 In one of his biggest accomplishments yet, he graduated from Queens University of Charlotte with a bachelor’s degree earlier this month at age 65. Sherrill’s troubles started at a very young age. He had a hard time learning to read when he was a kid growing up in Charlotte in the early 1960s, and he was embarrassed about it. To distract his teacher, he used to put tacks on her chair, or worse, steal money from her purse. By the time he was 8, he was skipping school regularly and stealing from the grocery store to feed himself and his four younger siblings. His family home was so dilapidated that when it rained outside he’d get wet inside. Sherrill was hanging out with teenagers who gave him wine, and he quickly developed a drinking habit, then a drug problem. He started breaking into homes and stealing purses, and as a teen eventually ended up in and out of prison and various treatment centers and halfway houses. This continued through his 20s and late into his 30s. “I was stealing so much - stealing from neighbors, stealing my nephew’s clothes to sell,” he said. He got married and had a couple of children, but he was an absentee husband and father. One day in 1988, he used his last few dollars to buy a bottle of wine, but his hands we so shaky, he dropped it and it shattered on the ground. “I was crying, and I was trying to get a drink off the broken glass,” he said. He walked over to nearby train tracks with a pistol in his hand and pointed it at his head. He pulled the trigger. The gun didn’t go off. Sherrill took it as a sign. None of the rehab centers in Charlotte would take him back. But a social worker found a halfway house in Morganton, North Carolina, about 60 miles from Charlotte, that accepted him. Starting fresh, he finally stopped drinking and using drugs. He started doing yard work for a woman who brought him along to First Presbyterian Church of Morganton. The pastor hired Sherrill to work on the grounds and other jobs. He said the pastor was the first man who ever trusted him. Sherrill cared about honoring that trust, and he even started to care about himself. He went to a literacy center and started learning the basics. After a time, he convinced his wife to move to Morganton and bring their five children. Two of his daughters were in second and fourth grade; he couldn’t help them with their homework. Little by little, he learned to read and write. He took the high school equivalency exam five times and failed. On the sixth, he passed with one point to spare. He had never had a bank account, so his friends at the church helped him open one. And he wanted a better life for his children. “I was determined my children would not grow up like I did,” he said. He moved back to Charlotte for a job as an events setup coordinator for Myers Park Presbyterian Church. He started taking college classes. It took him eight years to earn his associate’s degree. Around that time his son was close to graduating from high school. Sherrill went by Queens University to figure out how to help his son apply for entry, and also for financial aid. The staff explained the process and told him he should apply himself. He declined, saying he was too old, but he helped his son successfully apply to North Carolina A&T University in Greensboro. He wanted to be sure his son stayed in college, so he came up with a challenge. He’d enroll and have a little friendly competition with his son: Whoever got the best GPA at the end of each semester would give the other one $100. “I was challenging my son so he wouldn’t drop out,” Sherrill said. In the process, he found he was enjoying taking college classes, and also feeling great about himself. His son graduated in four and a half years and is now a financial adviser with Merrill Lynch. It took Sherrill eight years, but he graduated on May 5 with a degree in human service studies. He’d like to get a job working with underprivileged kids. “I’m having a different feeling about myself, my self-esteem,” he said. He’s been sober for 29 years. And he has a college degree. He marvels at both of those things.